How long can an insect live? Cicadas might be up near the top. Some cicadas are famous for remaining in the larval stage for thirteen and seventeen years/ That makes them a pretty long lived insect, even if they spend most of that time as larvae underground, out of sight. A lot of cicadas are synced up in these thirteen and seventeen year cycles, so that in peak years, huge numbers of these insects emerge. Then they are everywhere, singing to attract mates so they can get the next brood of baby cicadas on their long road to maturity. Now, these two times – thirteen and seventeen years – are notable because they are both prime numbers. As I understood it, the leading explanation is that lots of things in nature tend to cycle. But most of those cycles are fairly short. One possible advantage of something that cycles with a prime number is that it’s unlikely that any other short cyclic events will consistently coincide with the emergence of the new adult cicadas. Imagine cicadas emerged on a twelve year cycle. Any predator that was on a roughly two, three, four, or six year cycle could sync up with the food feat of cicada emergence – provided there was a little give in their cycles so they could line up in the first place. But that sort of synchronization between predators and prey is much harder to do with a prime number. Thus, cicadas never face large numbers of predators just waiting for them to come out from their long larval stage. A new paper suggests that the cicadas might even reap a bigger advantage than that. 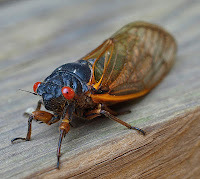 Koenig and Liebhold do a new analysis estimating how many birds are during each year when cicadas emerge in large numbers, and how many birds when the cicadas don’t. They have population estimates for fifteen predatory bird species over 45 years. Their data set is as old as I am. Surprisingly, there are routinely fewer birds on the years when cicadas emerge. The authors propose that this indicates that the long cycle has somehow allowed the cicadas to emerge during years that are safer than usual. The authors do briefly mention alternative hypotheses. Cicadas are famously loud insects. Maybe the cicadas are so abundant and noisy that they actually drive birds away from their normal habitats. They authors say this is unlikely, because the bird counts go down even in places where the cicadas are not calling. Koenig and Liebhold suggest that it's more or less coincidence that the cicada broods last for a prime number of years. They suggest that the emergence of these huge numbers of insects has some sort of knock-on effects, such that when they occur, the bird populations are effects, and go through booms and busts of their own - and the birds' low point comes around again in about thirteen or seventeen years. The details of how this might happen aren't clear. Photo by fmerenda on Flickr; used a Creative Commons license.